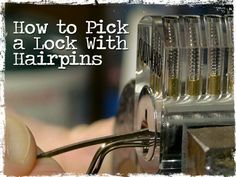 Tired of endlessly searching low and high for front door locks to no avail? Well, if you answered in the affirmative, you should definitely try what is, arguably, the best electronic deadbolt- the Yale security deadbolt. Characterized by a keyless design, you will never have to worry about stolen or misplaced mechanical keys. 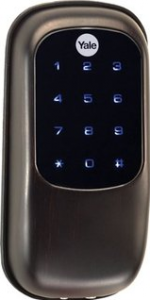 The Yale security deadbolt is equipped with state-of-the-art technology and a capacitive display which makes it capable of detecting where and when users touch the display and hence does not require a stylus for mechanical control. In addition, its exterior finish is capable of enduring long exposure to the elements and high/low temperatures. The illiterate and visually impaired will also appreciate this deadbolt lock’s voice assisted-program which is integrated into its hardware. Also, its auto-lock feature automatically locks the door once it clicks shut. Overall, this is a very high-quality touch screen deadbolt that offers a long service life and high level of security. 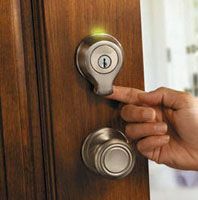 It is quite difficult to find a deadbolt that is functional, versatile and very flexible as the Schlage electronic deadbolt. Offering the best of both worlds, it works like a traditional deadbolt whilst also providing homeowners with the option of effortless touchpad entry. Moreover, the installation process only requires a single tool- making it extremely easy. Consumers can also delete or add access codes directly from the keypad which makes it ideal for large families as it can accommodate up to 19 user codes. The Schlage deadbolt comes with a BHMA/ANSI grade 2 certification so you can be sure that the safety and security of your home is in good hands.. It is easy to install, well rounded, and well worth exploring. 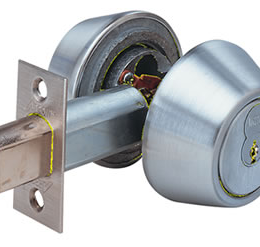 Kwikset is a trustworthy brand that has been providing households with high-quality door hardware and superior customer service for over 70 years. Such a long standing reputation says enough about its Belleview combo set- designed with a bronze finish that is made to stand the test of time. With BumpGuard technology and a high residential security rating (BHMA/ANSI Grade III), intruders will not be able to breach your home. Thanks to its Universal Handling Feature, the Kwikset Belleview is compatible with all left and right handed exterior doors. 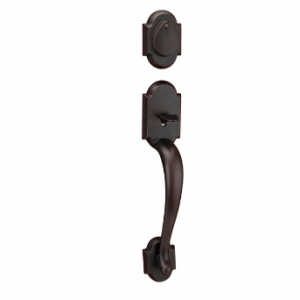 Overall, this deadbolt is designed to be aesthetically appealing on any exterior door while offering long service. It would be a mistake not to try it out further. Touchpad entry, keyed entry, and key fob remote control entry. Holds 6 user codes i.e. between 4-10 digits. Comes with a one-year manufacturer’s warranty. A lifetime warranty covering all mechanical components and finish. Available in several different finishes including antique/bright brass, matte black, distressed/satin nickel, and aged bronze. Matching handle and door knob set available, but likely to be sold separately. BHMA/ANSI Grade I security rating. 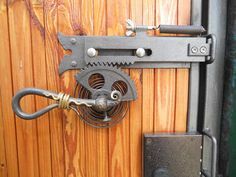 Overall, you will definitely appreciate this deadbolt’s high security rating and design. It is built to endure the elements and extremely cold/hot temperatures.